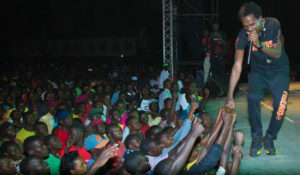 Mun-G performs on stage during the HIV/AIDS awareness concert in Mbarara. Courtesy photo. As the world marked World AIDS Day on December 1, Reach A Hand Uganda (RAHU), a youth empowerment organisation, delivered the message to the youth through the #iknowKati HIV/AIDS awareness concert held at Nyamityobora Sports Grounds in Mbarara for the first time. “Prior to the concert,RAHU team and partners had been to different communities like Rubindi, Rwanyamahembe, Kizungu, Kakoba, Bugamba and Katete to create HIV/AIDS awareness integrated with access to family planning services,” RAHU Team Leader Humphrey Nabimanya said. The day officially began with a 10km and 5km World AIDS Day Marathon and later went into speeches from local area politicians and stakeholders who emphasized the need to fight HIV/AIDS in Mbarara district. After the many speeches, the merrymakers were then treated to lots of entertainment from RAHU’s cultural Icons Geosteady, Mun*G, Allan Toniks, Nutty Neithan alongside top musicians that included FikFameica, DarxxKartel, Rena Nalumansi and Gravity Omutujju. RAHU offers services like family planning and cervical cancer screening and HIV testing and counseling, among others.